In a slow cooker, add the teriyaki sauce, chicken broth, brown sugar, soy sauce, minced garlic and sesame oil. 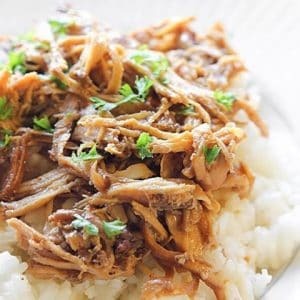 Place chicken breasts into slow cooker. Cover and cook on low 3 1/2 to 4 hours. Take the chicken out and shred with a fork. Place back into the slow cooker and stir to combine with sauce. Cover and keep warm while you make the rice. Serve chicken over rice and garnish with parsley if desired.